On Saturday, February 26th, seventeen teams from across the state of Arizona participated in what was the fifth consecutive Arizona Middle School Science Bowl. The event was held at the Tempe campus of Arizona State University and drew nearly 100 student enthusiasts in grades sixth through eighth to demonstrate their skills in science and math. The event offers an exclusive opportunity for a number of teams from across the state to come together, bring their best science foot forward, and compete for the coveted first place ticket to the National Science Bowl in Washington, D.C. The Arizona Middle School Science Bowl is regionally organized and sponsored by IT consulting services leader Solugenix Corporation and members of the Arizona Technology Council's Workforce Development Committee. The two organizations recruited over 40 volunteers to run the “jeopardy” style event this year. After a full day of round robins, double eliminations, and hundreds of scientific truths uncovered, the three teams to reach the final round were BASIS Scottsdale Team #1, Chandler Preparatory Academy and BASIS Scottsdale Team #3. BASIS Scottsdale Team #1 faced Chandler Preparatory Academy to win the right to represent the state at the National Science Bowl in Washington D.C. from April 28 - May 2, 2011. The first place team also received a complimentary mission on the simulator at the Challenger Center for Space Science Education in Alexandria, Virginia. 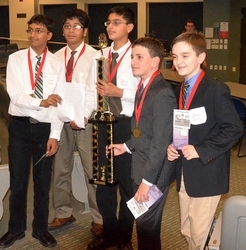 Second and third place teams received complimentary admission to the Challenger Center. About Solugenix: Solugenix is a privately-held company specializing in Microsoft Dynamics AX ERP solutions, IT Support solutions and Recruiting & IT Staffing services. The company provides connected ERP solutions and services from concept to customer for mid-market process manufacturing companies. The Solugenix Dynamics professional services team focuses on quick, efficient implementation, enhancement and support. Solugenix has offices in the U.S. (Irvine, CA, Phoenix, AZ, Chicago, IL, Atlanta, GA), Canada (Toronto) and India (Hyderabad and Bangalore). For more information call 866-749-7658. Twitter: @solugenix.